In the mood for some great music? Head to Union Station this evening where East L.A. based Camalanche will perform from 4-6 p.m in the East Portal. The Chicano-Jarocho group plays and promotes the traditional Son Jarocho in the spirit of the fandango, a celebration of music and dance. Get a taste of the groups exciting sound then head across the street for dinner and shopping at Olvera Street or take Metro to other local hot spots for an evening of great fun without the hassle of looking for parking. 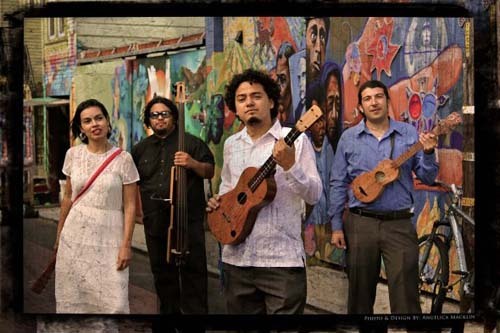 East L.A.-based Chicano-Son Jarocho group Camalanche. Continue the weekend fun Saturday by celebrating Asian Pacific Heritage Month with a special Metro Art Moves tour. The tour, led by artist and curator Sam Lee, starts at 10:30 a.m., at the Gold Line Chinatown Station – street level – before continuing on to tour stops The Wheels of Change of Chusien Chang in Chinatown Station, Through the Looking Glass or Traveling at the Speed ? ?of Light (Rail) Clement Hanami station at East LA / Civic Center. The tour ends at noon – just in time for lunch. We suggest you go to Purgatory Pizza, opposite the Pico/Aliso station. Show your TAP card and receive 10% off your order.